Samikhya society is formed by the EX Engg students who are well off and employed at Luke and corners of our country and also abroad. 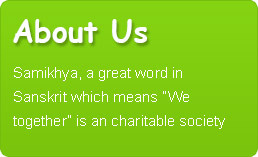 We mainly believe in the team work which is our “Driving Force” towards our goal. we feel it as an Opportunity in building a BETTER SOCIETY. Hence started with a primary activity with an INTENTION OF SPREADING AWARENESS OF BASIC EDUCATION wch is very essential 2 every individual. 2.Sponserd 2 girls for there Education. As a part of the service activities taken up by Samikhya, cheques of Rs 3,750/- each have been issued to two girl students to facilitate their education for the entire academic year. These girls who hail 4m Pitapuram , came from a poor back ground. so, there parents joined these girls in M.S.School so that they can atleast completethere primary Education. samikhya on its way of building a strong team , samikhya team visited various colleges in and around kakinada . our team members had an interactive session with the students and Recriuted student coordinators who are very active, enthustastic and well inspired by the social activities and have a responsibility towards the society. 4.Childrens day celebrations in Umamao Vikasa Kendram. Samikhya, which is all set to see a change in the Present Society, have extended its Service activities for the special children in fact who need utmost care. As part of Samikhya’s Responsibility, it conducted sports and games to the children of Uma Mano Vikasa Kendram,Kakinada and distributed prizes to the winners on the eve of Children’s Day celebrations. These children who wore smile as an Ornament on their face took an Active Participation and proved they are no more less than to the common people. January 9th 2009, Really a big day in Samikhyas journey as its official website (	www.samikhya.com ) was Launched By a great orator sri Vundavli arunkumar M.P Rajahmundry and the Souvenir comprising of all the activities that are performed by Samikhya Team is Released By great Visoneer Prof .Allam Apparao the first Vice Chancellor of JNTU KAKINADA in a splendid Colours youth Festival on Jan 9th. 6.Medical Assistance For ligament operation. Under dis Project Team samikhya came forward to make people aware of " How Important Our Fundamental Righht To Vote Is ". so samikhya started distributng pamplets in few villages n slums describing d importance of vote n how to utilise it.Team samikhya even forwarded this through mails to educate d youngsters of d importance of the vote. 8.Sponsering A Student from PRG Degree college. Murali krishna a B.com comp 1st yera student. he is from Talarevu village. This guy who lost his leg in an Accident and even his family head ,father last year . Due to which he discontinued his studies.Now after a break of 1 year he contacted Samikhya to Sponser him inorder to continue his Studies.After contacting the Principal pf PRG by our samikhya Team he is permitted to take as a reaamitted student. In this context his Fee of Rs 6000/- ( Readmission + College fees ) for the Academic Year 2009-10 will be Sponsered by Samikhya Charitable Society Adepalli suresh kumar our over seas contributor who is working as S.W Engg in US came forwardd to sponser half of the students fees. the team members and student community. With this support samikhya is planning to Extend its Service. On the occassion of samikhyas first anniversary team samikhya conducted sports to the children of Maharshi Sambamurthy School For PH and Normal Girls on 06/08/09. Morning session of 09/08/09: Conducted Personality development classes to the children of the same school By A.Udaybhaskar Founder of Vyaktitva Vikasa Kendram and Aftrenoon session :Provided lunch to them . Evening session: Guests V.L.Gandhi ex-principle of MSN , S.P.Reddy Founder of Uma Manovikasa Kendram, Ln.Padmajavani Rtd RNB Engineer , N.Sateesh Reddy Vice-Chairmen of Aditya Group of Educational Institutions. gave their valuable suggestions to the Samikhya Team , blessed the children and Distributed Prizes to the winners of the Games Conducted.